Philadelphia 76ers guard Ben Simmons dunks against the Orlando Magic during the first quarter at Amway Center. In the early days of Philadelphia's rebuild, the Orlando Magic were used as a point of comparison for the Sixers as they worked toward long-term success. "Look at Orlando, they haven't had to sink to that level!" was the rallying cry, as the Magic hovered slightly above the level of historic awfulness the Sixers dipped under. There is no comparison now. 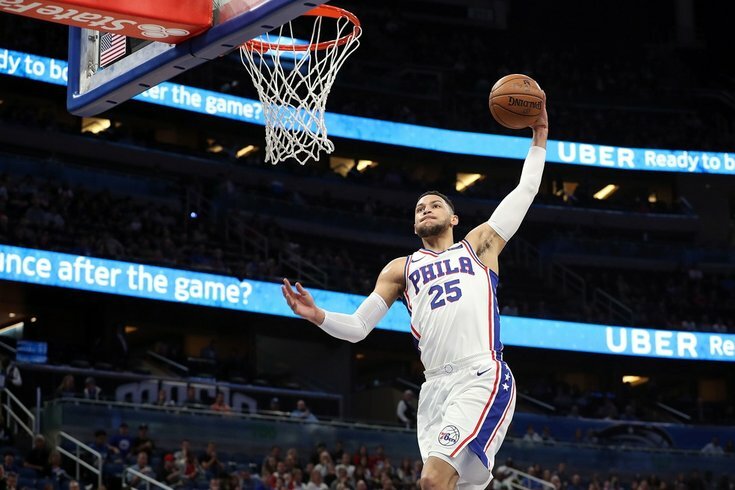 Philadelphia's sweep of the Magic this season has been a story about two franchises moving in opposite directions, the product of years worth of decisionmaking. The Sixers are headed toward at least one playoff series, and the Magic are just hoping to find a needle mover who can pluck them out of the muck. Plenty to talk about in this game despite the scoreline, so let's get right to it. Philadelphia didn't have their best quarter in the third — that distinction belongs to the second on Thursday night — but the third was the one that spoke highest of their team spirit. Up 20-plus at halftime and on their way to a convincing win, the Sixers could have easily taken their pedal off the accelerator and cruised to a win. They did no such thing. For the second night in a row, they smelled blood in the second half and relentlessly attacked Orlando at every opportunity, playing spirited defense in the halfcourt and in transition. Brett Brown spotlighted the effort of the starters in that frame after the game as the standout item of the game. I think that our third period was the thing I was most impressed with. We held them to 16 points, we scored 25, we had too many turnovers in that period. But we knew with the lead that we had built, to be able to maintain that sense of urgency and treat it as an opportunity; if we can build on this lead we can actually get some of our high-minute guys some rest. I was impressed with their attitude coming out of halftime. [Just] like last night when we jumped on Memphis, I think that third period was a statement period for our team. The tape lines up with that suggestion from Brown. There was no let-up in a game where some would have been expected, and that stretch said a lot about the basketball character of this bunch. One play that stood out in particular: a fast break gone wrong for the Sixers early in the third. A Joel Embiid steal sent them off to the races, and Simmons tried to get a little too cute while rewarding his big man for running the floor. But instead of accepting that Orlando would go back the other way and score, Simmons took off like a bat out of hell to slow down Aaron Gordon, which bought Robert Covington enough time to get back into the play and end the transition threat. Keep a close eye on Simmons at the end of the play. He is visibly distraught about a turnover that will have no impact on the final outcome of the game. To this observer, that reflects a care about his craft and a pursuit of mastery that will carry him to greater heights in the future. The Sixers are filled with players like this, from their headliners down to the role players on the bench. They kept coming as the starters slowly started to trickle to the bench. Up 31 points midway through the quarter, they forced Orlando into a shot-clock violation with a great defensive possession from all five guys. Multiple switches, an Amir Johnson dive, and a Covington swipe later, and the Sixers earned themselves a stop. In the grand scheme of things, these plays mean very little individually. But when people talk about building a culture, these plays are what it's all about. How you act in a blowout reveals part of who you are, whether you're on the winning side or the team getting smacked around. You can't control a lot of things in sports, but you can control effort no matter what the score is. This Sixers team is on a mission, and with lofty goals in sight they are even raising the bar on their expectations. "After last night, knowing we were in fourth position, we just wanted to come out and send a message, let everybody know we were going for home court," said Embiid. "But after this game, I kind of have a new goal: I want to get to 50 wins. If we can do that, that'd be great, so we got to keep pushing for that." With only four real challenges left on the schedule, the Sixers have an outside chance at making that happen. Minnesota comes to town on Saturday night, offering one of the few tests they have left between now and April 11. Passing is contagious, as we discussed after the Memphis game on Wednesday, and nothing will light a fire under guys more than feeling like they can get easy buckets if they simply get out and run on the fast break. No player can move as fast as the ball can, and that's an age-old maxim the Sixers believe in wholeheartedly. They have several players who have their eyes focused down the floor when they collect a defensive rebound — primarily Simmons and Dario Saric — who also happen to be capable of hitting guys in stride with long passes. That's how you end up with plays like these, when a Simmons defensive rebound turns into a Marco Belinelli assist, with Ersan Ilyasova needing to do little more than run and shoot a layup. "I think that the guys came out and immediately started sharing the ball," said Brown after the game. "I thought our defense was good, I thought our sharing the ball was great. Something as simple as ball reversals and getting the ball through hands, to come in with 20 assists in the first half on 26 made field goals, I think set the table." The Sixers have been hurt all year by the fact that they don't have any real isolation scorers. It takes movement, precision, and several moving parts for them to generate offense most nights. You could make the argument, however, that this prompts a level of activity and movement away from the ball that other offenses can lack if they rely on individual creation. Embiid doesn't mind tearing down the floor when he knows a pass-first player is pushing the pace, and he unleashed a hellacious dunk off a T.J. McConnell dump off early in the second quarter. If you can't enjoy watching a team play this way, basketball is probably not the sport for you. Taking care of business doesn't mean you have to play boring, methodical basketball. This is a sport and an entertainment product after all, and the Sixers generally do a decent job at injecting some brevity into games that can be stressful for fans. There was a whole lot of that against Orlando, even when it failed like that behind the back pass. Embiid came up with one of his more noteworthy plays of the season near the end of the first half, when he began galloping down the court before a three dropped a la Steph Curry. As it turns out, that was the exact guy he was trying to emulate. "I just grabbed the offensive rebound, went to the corner, and I heard my teammates, the whole bench went, 'One shot! One shot!' And I was like, eff this, I'm going to shoot this," said Embiid. "As soon as I shot it I knew it was going in, and I felt like Steph Curry, and I just went back on D before I went in. That was a good sequence, I've always wanted to do that, and I had an opportunity to do that and it worked pretty well." It remains preposterous for a player Embiid's size to even think about pulling off Curry plays, let alone executing them. But hey, maybe they should have rebuilt like the Magic.